True, I strayed for a while from the path of enlightenment. I had decided – not quite way back when, but a long time ago, anyway – that I wouldn’t be left behind by the surge that PC’s were making. I even had a period where I maintained a machine on each platform. 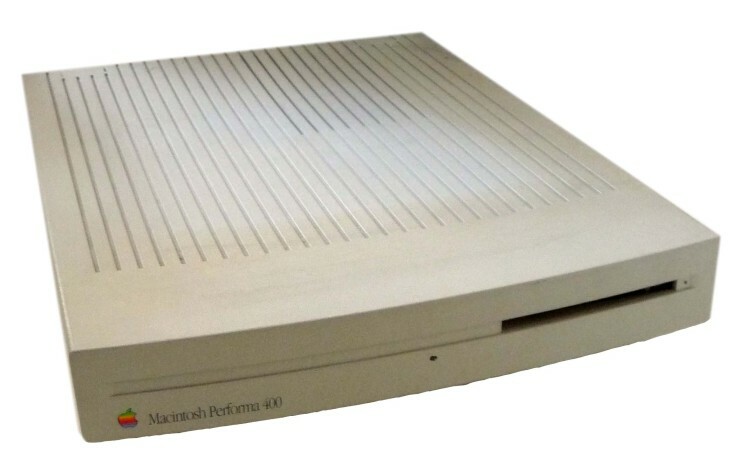 My beloved Mac Performa 400, with a whopping 80MB of memory – for the whole machine – and a blazing 16MHz processor. And a state of the art Compaq laptop, with a staggering 14.4k dial-up modem, which had to be plugged into the card slot, cause they hadn’t yet figured out how to incorporate it into the body of the computer. And MS DOS 3, if memory serves. What a rude awakening that was, coming from the Mac platform. Of course it wasn’t nearly as advanced as the home machine. so there was some waiting involved, if you wanted to get anything done. I was on the cutting edge; the sharpened, bloody point of a massive revolution, that was going to change the world forever. Did I know that at the time? I just didn’t want to be a dinosaur at that point in my life. When Mac released the Powerbook G3, I dumped all other machines, and never looked back. But I’m not necessarily a follow-the-crowd sheepmeister, where my computer is concerned. I don’t run out and get the latest and greatest machine, or the newest software, just because it’s been released. And I certainly don’t have an iWatch… nor will I ever. My iPod is the classic; because I care about how many songs I can store on it – not what it looks like. But I do listen to the people. When they say something is great, I file that information away. When they say something is rotten, I file that info, too, but with a bullet. So I’ve been on an OS at least 2 generations old. Because when half your users rate the upgrade at 5 stars, and half rate it at 1 star (because 0 stars isn’t an option), then I’ll be ding-dang-darned if I’m going to put substandard software on my machine. But OS 10.11 came out about two weeks ago, or so. The raves are outstripping the rants by about 100 to 1… give or take. That’s the kind of numbers I like to see. Still, I am on a bit of an older machine. And I’ve got some ongoing issues with a piece of Microsoft code. Yes, I did a backup right before the upgrade. Don’t you kinda wish you could do that with life sometimes…? I haven’t minded upgrading with Mac up until Yosemite. I do a lot of layout, newsletter bulletin creation and the powers that be have taken away the ability to link text boxes in Pages. Why? I have prayed to the Mac gods, danced my dance, sung the songs of my people and they continue to give me the cold shoulder. No response, no reasons for the change. Most of the time I find the updates, upgrades, upwhatevers fine and dandy. This little feature has got me more than a little sad that Mac has not listened to the needs of those who don’t want to Adobe, but play nice with Pages for a little longer. Absolutely necessary in any song from the cannon of my people is the accordion. Although sometimes we do opt for a bagpipe. I haven’t upgraded/parallel parked/or whatever El Capitian. Fancy names have the smell of sinister plots, lots of gun powder and fire. Oh wait, that’s Guy Fawes, but just (I’m convinced) as sinister. Also acceptable as answers to this category are: spandex, talk radio and Brussels Sprouts. Oh, come now! The Brussel Sprout is a much maligned and misunderstood vegetable. I will give you the bagpipes as they are typically only used at funerals and to accompany to good night out with the cats on a fence waiting for the other shoe to drop. Brussel’s Sprouts were voted the worst vegetable of the year last year. They’ve also been voted the worst vegetable of the year for next year, as well. No need to wait ’til the last minute, I always say! I would take a well turned Brussel Sprout over a cooked carrot any day of the week and twice on Sundays. But I understand the hate. It took sautéing to make me change my mind over a steamed sprout. But it’s much too early to be getting into puns. The coffee must flow, before the raft of puns can cascade down the river of pre-dawn humor and…. Yo empecé con un classic y ahora ando con un “Mac mini”, y sin problemas. Yo también tengo un “Mac mini”, pero no lo he intentado actualizar que uno todavía. Gracias por pasar.